First Time, Apple made Customize Control Center in iOS 11, after that in iOS 12 Beta 1 Apple added two new shortcuts included Hearing and Scan QR Code. Among all of the shortcut options, the Hearing does work as Live Listen. So today, here I’m showing you how you can use Live Listen with AirPods features in iOS 12. Note: Live Listen feature found in iOS 12 Beta 1, might this feature may not available worldwide when pubic iOS 12 coming this fall. Requirements: Who can use Live Listen Feature in iOS 12? Just Apple Wireless AirPods users can quickly activate and use Live Listen feature on its iPhone with AirPods using Control Center. By default, Hearing won’t make available into control center because Live Listen feature is hidden so that first you will have to add Hearing into Swiping up Menu. Step #1. Open the Settings App that looks like a Gear icon. Step #2. Find Control Center tab. Step #3. Tap Customize Control Center. Step #4. Scroll down the screen to add Hearing to CC [Control Center]. After added Hearing into Control Panel. Follow bottom guide carefully. Now you can activate Live Listen on your iPhone with AirPods. 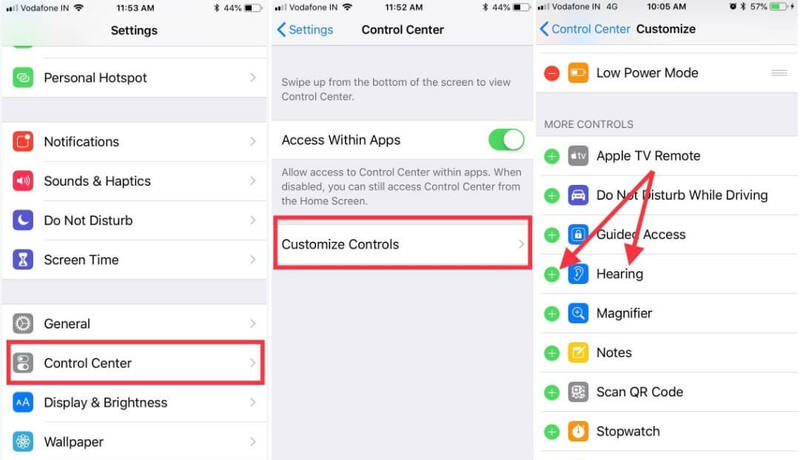 For iPhone X and iPad users running iOS 12 – Access Control Center by pull down from the upper-right side corner. > Now you can see Live Listen off (•••••) > tap on Live Listen to turn ON. Note: Live Listen option not Available or Live Listen Missing – So you must wear both AirPods to get Live Listen option on the screen. Don’t put into AirPods Charging Case. Otherwise, you don’t find Live Listen option. That’s Easy. Enjoy Live Listen. Lets we see some FAQ on Live Listen Feature in iOS 12. Can I work with any Apps when Live Listen ON? Yes, you can access any application when you live listening sound around you. You can listen outdoor disturbance as well as hearing easily people taking away from Approx. 10 foot from you. Can I Continue Live Listen with AirPods on Lock Screen? Yes, if you would like to use Live Listen feature with locked Screen Phone, then you can do. Besides, Live Listen works with AirPods, so that, you can put your Phone into the pocket while you use Live Listen. How do I Control Live Listen Volume? Interesting question, the user can increase, and decrees Live Listen volume using iPhone Volume button available on Control Center. Note: if you can see hearing Shortcut into Control Center then your device won’t connected to AirPods. Therefore, your AirPdos must connect to your iOS device. Otherwise, the Hearing option missing and by the way you unable to use Live listen feature on your iPhone running iOS 12. We had noticed when we were using live Listen with AirPods on my iPhone X battery Drain fast then normal mode. In more, AirPods battery also drains fast than we are listening to Music. If you are unable to use Live Listen feature or Live Listen won’t turn on or can’t start then you should reboot your iPhone and try again. This solution worked on my guardian iPhone 8 Plus Live Listen.